Its been a crazy first week on the road... the freedom of living a life of car camping and sleeping in the forest, meeting up with others along the way; and of course, sampling the local breweries and BBQ joints has been both liberating and exciting. Needless to say, there's also some serious adjustment involved when it comes to daily life... and so far we've been enjoying every minute of it. Home has mostly been a Dutchware Gear Chameleon Hammock with appropriate quilts and tarp for the cold & rainy weather. We fished a few streams on the way to our first camping area, but for me the most memorable day so far was the second day in one of Maryland's many "brook trout forests." After a backcountry breakfast of champions, we drove just a few miles from our campsite to what can only be called a picture perfect wild brookie stream. Game on. Because the sun was so bright, we had to work somewhat carefully to avoid spooking fish. The good news was that they were holding relatively low in the cold spring water and we did a fine job of finding fish most of the day. Rob crosses the stream holding a beer... expertly done, and great practice for our more serious stream crossings coming later in the season out west. I was in awe of this place, but I wasn't letting the natural beauty distract me much... there were plenty of beautiful brook trout to present to, and only so many hours in the day. Plunge after plunge and riffle after riffle, we drifted kebari (and admittedly even some small bead head flies) to willing wild trout left and right. ...traveling light on the river is great, but having some space for lunch and a few other items is key. Truthfully, I could have made due with nothing more than the rod and some flies this day, hunger be damned... because it was one of the most fun and beautiful days on the stream I've had in well over a year. The fish were cooperating too, which is always nice! Every bend yielded another picturesque run or little bathtub to marvel at, as we approached to make our presentations. Holes like the one below are why we had to bust out some beads... the fish just weren't coming up for a manipulated fly fished in the Tenkara style here. 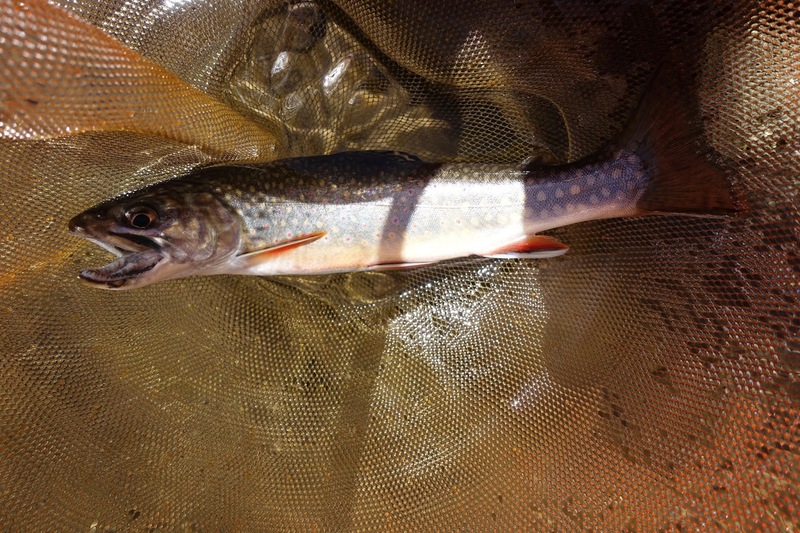 It happens to everyone sometimes, and, well... sometimes you also know there's a "trophy brook trout" down there and you have to do what it takes if you want that fish. I got that fish. Too bad the photo is washed out in the bright light. Is this not a stream that we've all dreamed of in our wildest small-stream dreams? We found many fossil-laden rocks along the banks and there was plenty to observe in them by focusing on the small details... shells, mini sand dollars, and more. The wildflowers were out in force, and while a gentle green carpet had begun to coat the forest floor, we were a bit early for the mushrooms we were also hoping to find on that day. As the shadows became long and the angle of the light changed, alerting us that the final hours of light were at hand, we found a few more nice spots to fish before turning around. Rob caught what I considered to be the fish of the day at the last run here. I thoroughly enjoyed the walk out as well, taking in the scenery from new angles and with the altered perspective of a hiker rather than a fisherman. There was some kind of old trail and bits of old road that intermingled along the edge of the stream, which made the walk out easier than expected. Back at the campsite, we filled the snowpeak fireplace grill with wood charcoal, loading on top of it a few choice menu items that we could not wait to devour in haste. After dinner we tied flies (and admittedly some bead heads too) and prepared for incoming rainy weather, as well as another week of Tenkara fishing in Maryland's brook trout forests.